I see no reason for doing ppa-purge, or anything else at the moment, since we all have a working systems, do we? The fault in the current version of libgl1-mesa-dri package is that the-new-file-to-be-installed /usr/lib/<architecture string>/pkgconfig/d3d.pc has been incorrectly name as /usr/lib/<architecture string>/pkgconfig, let APT complain that you're trying to overwrite an existing system directory(/usr/lib/<architecture string>/pkgconfig) with a regular file. and control.tar.gz/md5sums, then repack them back to correct debian binary package. That is just wrong. I have updated even xorg packages, like nvidia and radeon package, without issues. Also other packages like opera-beta have updated just fine. But even if it were true, waiting a bit should not be a probem for people running oibaf. Telling him to fix the issue as soon as possible is rude and silly. Regarding rest of your post, thanks for the info and instructions. The last Oibaf PPA update fixed the issue. I can confirm this. The issue has been fixed on my system with Intel Sandy Bridge graphics. Hmm... Well the thing is, I was using aptitude (What I always use.) and I had no issues with installation or upgrade of packages. Another + for aptitude ; ). The file '/usr/lib/<architecture string>/pkgconfig/d3d.pc' is now packaged by mesa-common-dev instead of libgl1-mesa-dri, which means if you follow my instructions to workaround & actually install 10.5~git1411191810 version of libgl1-mesa-dri you'll encounter another but different "overwrite error" during next upgrade due to the duplicate '/usr/lib/<architecture string>/pkgconfig/d3d.pc' file. To solve the problem simply remove '/usr/lib/<architecture string>/pkgconfig/d3d.pc' as root and run '# apt-get --fix-broken install' again. Hi, the Direct3D 9 State Tracker is now in obiaf's PPA, as it's in upstream Mesa. 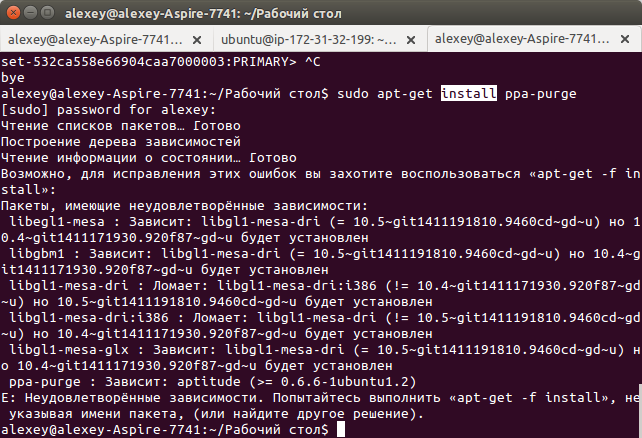 If you want to use it on Ubuntu(trusty/utopic), here is the wine PPA. For nouveau, DRI3 is enabled by default, though it mostly untested with Nine. For intel only cards, ilo isn't far enough to support 3D games, though Nine should support it when it gets there. Make sure to restart X if you install the second PPA. Last edited by sarnex; 11-20-2014, 09:06 PM. KWin VSync doesn't work with DRI3 or it's just me? Nope, not just you. Present support has not been started for the Radeon DDX, so vsync isn't supported at the moment. I totally understand if you revert.